The results are instant and flattering – the procedure can provide you with a vibrant brow change and completely change your face. You might have a lot of questions about the procedure before you make your final decision, and we are happy to guide you through some of the most common questions people ask when it comes to microblading. Once you have the procedure done you should expect to enjoy the results for anywhere from one year up to three years. It does depend on how well you take care of them and your ability to follow the after-care procedures your technician will provide you with. The process itself takes anywhere from two to three hours. We block 3 hours for all new clients. 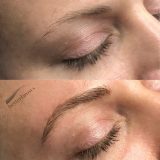 The appointment will start with a consultation to assess your natural brows and talk about what you are looking to achieve. Then the design process starts. We spend a lot of time during the first appointment to make sure you are happy with the design before moving forward. The artist will sketch the design and the client will give feedback. This back and forth of tweaking the shape and getting feedback will continue until the client is happy. Then numbing cream is applied for 20 minutes. A custom color is mixed for every client based on the desired healed color. Afterwards the microblading begins. One of the most amazing benefits of having your brows microbladed is that you get the benefits of a tattoo without the lifetime commitment. Yes, while it is technically a tattoo, microblading will fade over time. The pigments we use are designed to fade over time. This is desirable since as years go on our face and skin changes. The brows that suit our face at 25 are not the brows that work for us at 35. As styles change so too does the shape of your face and your tastes. If you want to enjoy the benefits of your new brows for as long as possible, there are steps you can take to maintain them. Follow the aftercare instructions you are given. Avoid the sun while your new brows are healing. Once they are healed use SPF over the area. Have your touch up done as directed by your technician. Avoid swimming and sweating during the first week after having the procedure done. Keep retinol products away from the brows. Don’t just walk into any salon for this procedure. It’s important that you choose an artist with the relevant experience and training to complete the procedure safely. Take a look at their previous work to ensure they can create the style and look you are trying to achieve.